Baalam set off on a journey to do some sorcery work for Balak, the king of ancient Moab, in exchange for a large sum of money. Even though God had sent a message in a dream not to do the work – which involved spiritually cursing the Israelite people whom God had blessed – Baalam let greed take over in his soul and chose to take on the Moabite assignment despite God’s warning. God was angry that Baalam was motivated by greed rather than faithfulness. 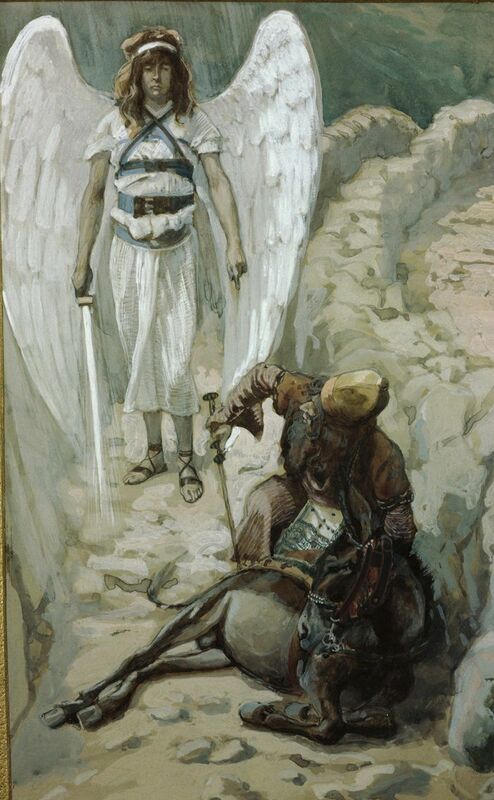 Balaam went on to beat his donkey twice more as the donkey moved out of Angel of Lord’s way. Each time the donkey moved abruptly, Balaam got upset by the sudden movement and decided to punish his animal. The donkey could see the Angel of the Lord, but Balaam couldn’t. Ironically, even though Balaam was a famous sorcerer who was known for his clairvoyant abilities, he couldn’t see God appearing as an angel – but one of God’s creatures could. The donkey’s soul was apparently in a more pure state than Balaam’s soul was. Purity makes it easier to perceive angels because it opens up spiritual perception in the presence of holiness. Then, miraculously, God made it possible for the donkey to speak to Balaam in an audible voice to get his attention. “Then the LORD opened the donkey's mouth, and it said to Balaam, ‘What have I done to you to make you beat me these three times?’" verse 28 says. The donkey spoke again, reminding Balaam of its faithful service to him every day for a long time, and asking if it had ever upset Balaam before. Balaam admitted that the donkey had not. “Then the LORD opened Balaam's eyes, and he saw the angel of the Lord standing in the road with his sword drawn,” verse 31 reveals. Balaam then fell down on the ground. But his demonstration of reverence was probably motivated more by fear than by respect for God, since he was still determined to take the job that King Balak had offered to pay him for, but which God had warned him against. After getting the psychic ability to see the spiritual reality in front of him, Balaam had insight to go with his eyesight and realized why his donkey had moved so abruptly while traveling along the road. God, in angelic form, then confronted Balaam about how he had abused his donkey through the severe beatings. God’s declaration that he would definitely have killed Balaam if not for the donkey turning away from his sword must have been shocking and sobering news for Balaam. Not only did God see how he had mistreated an animal, but God took that mistreatment quite seriously. Balaam realized that it was actually because of the donkey’s attempts to protect him that his life was spared. The kindhearted creature he had beaten was only trying to help him – and ended up saving his life. Balaam replied “I have sinned” (verse 34) and then agreed to say only what God instructed him to say during the meeting to which he was traveling. God notices and cares about people’s motives and decisions in every situation – and he is most concerned about how well people choose to love others. Mistreating any living being that God has made is a sin in God’s eyes, because every human and animal is worthy of the respect and kindness that come from love. God, who is the source of all love, holds all people accountable for how much they decide to love in their own lives. What Is the Easter Miracle of the Resurrection? What Happened With the Mysterious Angel Jacob Wrestled in the Bible? How Does Archangel Haniel Take Enoch to Heaven? How Did an Angel Expel Adam and Eve From the Garden?